The partlet began life as a small yoke piece to cover the low, square necklines of the Tudor period. It was worn on the outside of the garment and was often made of the same material as the dress but could also be made of other materials and was often very richly decorated. When made of lawn, linen or other light weight fabric, its job was to act as a chemisette or habit-shirt. A modern equivalent would be what we would call the "dickie". Suprisingly, partlets were worn by both men and women from the Tudor through the Elizabethan time periods. Somewhere between the Tudor and Elizabethan period, the partlet migrated from the outside of the garment to be worn under the garment but over the corset. At this time, detachable sleeves could be added to the partlet and most often matched the partlet material in both fabric type and embellishment. Very often, what we see in portraits of the time period and think might be a shirt is probably a partlet and matching sleeves. Partlets could be white, black or of various other colors. They could be made of lace, embellished with cord and jewels or be completely plain or gathered. During the Elizabethan period, the partlet took on the added responsibility of protecting the ruff from the face and neck. By wearing a partlet, not only did the ruff require less laundering but it also provided another base with which to anchor the ruff. The partlet is one of those very versitile accessory pieces that has the ability to be made quickly, embellished quickly, and worn with several different garments. It keeps one warm in the winter and from sunburn in the summer. To make a basic partlet, you must first decide on whether or not you wish to make a modern adaptation or a historically accurate piece. I've made and worn both. The advantages of a modern adaptation are that it tends to fit more smoothly under the garment. Unfortunately, it is somewhat difficult to put on and take off by yourself. The historically accurate model tends to have a few wrinkles here and there but is much easier to get into and out of. Notice that the back piece is cut out on the fold. 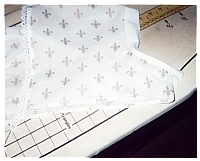 Once you've cut all your pieces out, sew together at the seams using a french or flat felled seam. In general, Elizabethan partlets are unlined and a french or flatfelled seam takes care of those raw edges. The collar for a partlet can be either very simple or somewhat larger and fitted so that it lays against the ruff as a cicular shape. The pattern above shows the simpler variety. Attaching the collar and frenching or flat felling that particular seam can be a bit tricky. My favorite alternate method and a fairly historically accurate one is to attach the collar and bias bind the seam on the inside. Finishing the partlet edges can be done by either rolling the seam or bias binding the seam; both are historically accurate and fairly straightforward. I usually always bias bind the arm holes but have rolled that particular edge when the fabric was of very fine material. If you have decided to have detachable sleeves, bias bind the armholes with fairly wide bias and place some eyelets in the bias binding. Make up your sleeves like long tubes, gathering the tops into a bias binding and add coresponding eyelets there. Trim out the cuffs as you like and, viola! Sleeves. Partets are suprisingly easy and quick to embellish and you can easily get carried away.The best way and the most historically accurate method of embellishment is to draw the partlet pattern onto your fabric but not to cut it out until after you are done with your embellishment. This way, when you put the fabric in a hoop or onto a stretcher, you can embellish to the very edges without stretching or pulling the fabric out of shape. Since partlets are so small, this is a relatively easy thing to carry around with you. Embellishment of partlets can take many forms. Embroidery, couch work, black work, white work, beads, jewels, or a combination of any or all of these methods. 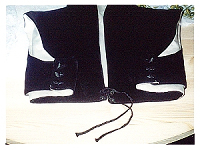 Three partlets: The black velvet one is typical of the Tudor eral. The white one is made from lace and the one with the fleur-de-lys is embroidered and couched with cord. The Tudor era partlet, being worn on the outside of the garment, has buttons under the arms. It could also tie. Inside view of the Tudor partlet button holes. Laying the partlet pattern out on the fabric. The back pattern is laid on the fold and the front is laid along the selvedge. The new partlet, completely sewn together and waiting for bias binding on the arm holes. 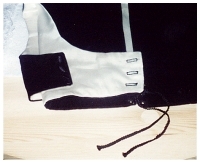 The addition of the bias binding on the arm holes.